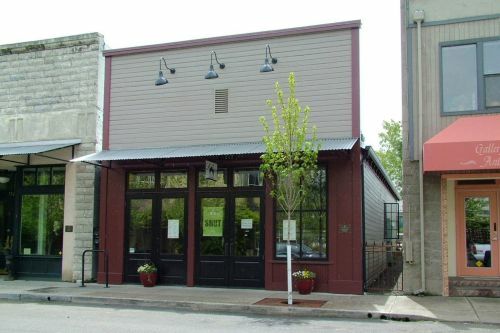 The current owners, David Gremmels and Cary Bryant purchased the dilapidated building in 2000 with a vision of opening a wine and cheese bar. After researching cheeses at the Rogue Creamery, they ended up buying that business and put on hold the planned restoration project. When local chef, Helena Darling was looking for a space to open a new restaurant and catering business, David and Cary saw an opportunity to revive their vision to save the 100-year old VanSant structure. They turned to architects, Carlos Delgado and Tom Sager and, building contractor, Jerry Nutter to design and construct the restoration. Jerry Nutter has assisted the owners in minor repairs and installations of salvaged building components over the years, but the major work began after Carlos and Tom secured Planning approval for parking variances and plans for a completely new and rebuilt storefront with historically accurate details derived from old photos. The wide use of recycled and restored siding and other material throughout have created a wonderful environment full of historic character. This setting is perfect for Helena’s new restaurant, appropriately named the Ashland Palace Café in reference to the original 1910 “Palace Chop House”. The National Historic Register Emil & Alice Applegate Peil house was originally built as a single story bungalow by local contractors Moyer and Van Natta for Emil and Alice Peil in 1910. It is the best surviving structure associated with the noted early Southern Oregon pioneer educator, cultural and community leader Alice Applegate Peil the daughter of Lindsay Applegate. Alice lived in the home for forty years and after the ownership of the Peil family the home had many owners. It suffered from several poorly executed remodels, neglect and was a rental for many years. 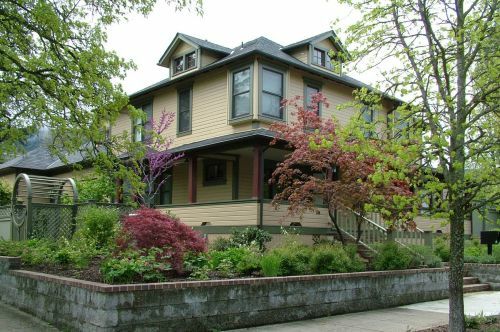 Fortunately Neil and Lorena Harris had always wanted a historic home on Granite and bought the home in 2003. From this time on there have been nothing but great things happen to 52 Granite! The owners initially worked with architect Rob Saladoff who suggested possible changes that could be made to restore the property. The major design work and construction was done by Robert Burstein who has previously been honored by the Historic Commission for his work. The home was originally built with a small dirt basement under the house. The biggest change to the home took place when the entire area under the house was excavated to double the square footage of the original structure and create a period appropriate addition to the home without alliterating the original appearance of the home. This new lower floor includes a family room, a wetbar/kitchen to service the outside patio barbeque, master bedroom, two baths, office, and laundry. The original house was left very much as originally constructed with only small modifications made to the floor plan. The kitchen and bath were remodeled using period appropriate materials, the original floors refinished, woodwork repaired and painted, and new light fixtures which are duplicates of originals installed. All of the plumbing, wiring and heat-air-conditioning systems were replaced. Outside the roof was replaced, stone work cleaned and re-painted, and the siding and trim restored and painted. The landscaping was all redone, raised beds added and a white picket fence built. 52 Granite is now ready for its next 100 years! It seems so appropriate that Lorena Harris is a descendant of Ashland Pioneers including the Bennett, Gidding, Million and Wimer families. The Harris’ have a turn of the century photograph of one of Lorena’s ancestors in a group with Alice Applegate Peil. I’m sure the Peil’s would be overjoyed if they could see the love being lavished on their home today! The Galbraith-Winne House at 160 Sherman, built around 1904 in the 1888 Hunsaker’s Addition, is an early example of cinder block construction, specifically known as “miracle-block”. The property was purchased by George Eaton in 1898 from George Crowson. Eaton, a carpenter, built his vernacular styled hip-roofed house with an L-shaped porch supported on Tuscan Doric columns. Further original classical detail are seen on the top course of slightly rusticated block, which displays an acanthus relief pattern wrapping around the entire square plan of the house. The large front windows are a 12-over, single-hung sash style. 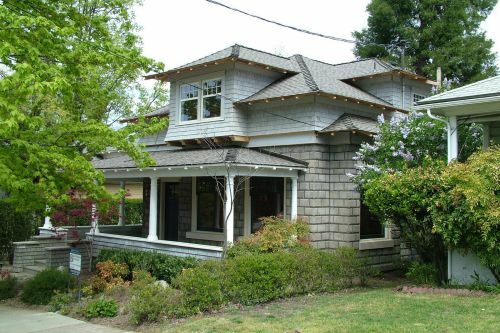 In 2005 the house was purchased by Jong Limb and, in 2008, Nautilus Design and Benchmark Builders were contracted to raise the roof, expanding the one and one-half story to a more functional two stories. The original house had one bedroom and bath on the main floor, and a sleeping space upstairs, accessible by a staircase that did not meet modern code. The expansion of the second story was a rather difficult task both in design and construction, as it was necessary to marry the original hip-roof with a new, higher hip-roof, while respecting the over-all proportion and style of the house. The entire upper part of the home was removed and the downstairs gutted. With the addition of some steel beams, Benchmark Builders was able to create a new second storey with two bedrooms and baths, accessed by a comfortable and compliant staircase. Respecting the original window placements, the downstairs remodel recreated arched wall openings and improved the spatial flow. The result is a charming expanded home with hip-roofed dormers, multi-light windows and shingled porch that shows off the original rusticated cinder block to perfection. The new raised central portion of the second storey is shingled, visually tying it with the porch and complementing the miracle-block. The upper windows are 8-over sash that reflect the original 12-over first storey windows. In addition, the designer faithfully carried the gentle curve of the original hip lines and rafter tails into the new dormers, employing an imitative approach that correctly interprets the vernacular style while meeting the needs of a modern family. Houses, like people, sometimes experience a number of incarnations across their lifespan. The Julius P. Wolfe house located at 586 B Street is no exception. 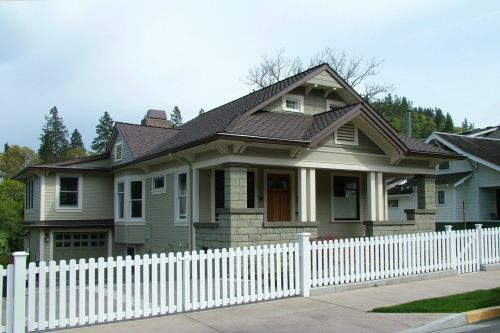 Originally constructed in 1909, the Arts and Crafts style bungalow was the home of Julius and Mamie Wolfe. Mr. Wolfe was the manager of the Southern Pacific Depot Hotel, once the heart of Ashland’s Historic Railroad District. After Mamie’s death in 1955, the house has been utilized as a bed and breakfast and even a women’s crisis shelter. Imagine the great variety of stories that are contained within its walls-stories of love and pain - the things that together make up a life. Current owners Daniel MacEachron and family sought to bring back the original character of the house, and enlisted the expertise of local Ashland architect Robert Saladoff to bring their ideas to life. The scope of the project was remarkable. Today we honor the compatibility of the newly constructed accessory building on the 5th Street side of the property, but stopping there would be a disservice to the overall project. Defining compatibility is an illusive task, but the structure’s shake siding is the perfect compliment to the home and overall property. The entire home was carefully renovated. All new electrical and mechanical systems were added, historically incompatible additions were corrected, and wood flooring was repaired and replaced. The interior seven bedrooms on the second floor were reduced to three to again reflect the needs of a single family, and a small guest room, mud room and breakfast nook were created on the first floor. New paint and period wallpapers were added throughout the house. The exterior and outdoor spaces of the home were completely redesigned and a pool was added to the adjacent second lot. Wonderful and private sitting spaces were created at the side and rear of the home. The new paint scheme of the house and outbuildings was painstakingly researched and compatible trim and casing colors were chosen as the final ingredient to the rebirth of this very special home. The efforts of architect Rob Saladoff, interior designer Angela Harrasser, structural engineer Allan Goffe, general contractor Bostwick Construction and landscape architect Kerry Kencairn are remarkable, as is the commitment of the MacEachron family. Together, they have preserved a wonderful piece of Ashland history that enriches our neighborhood and contributes to the sense of place so important in Ashland. Ashland’s Lithia water comes from the Pompadour Chief Springs located about four miles east of the City. In 1914, with the slogan “Ashland Grows When Lithia Flows,” Ashland citizens passed a $175,000 bond to develop Lithia Park and build a pump and distribution system for the highly mineralized water. 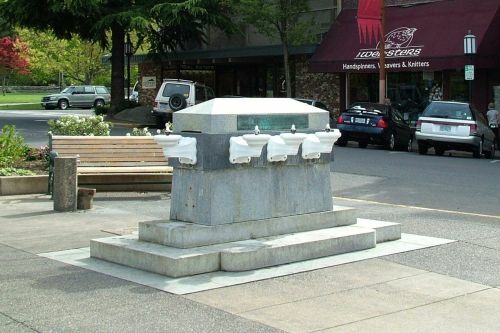 The system was built, and in 1927 Ashland’s Chamber of Commerce petitioned the City Council to make Lithia Water available on the plaza. The Lithia Fountain, built of locally quarried Ashland granite, was installed later that year. The original porcelain basins were replaced in the 1950’s. Over the years, due to extensive corrosion caused by the heavy mineral content in the water and vandalism, the fountain became increasingly damaged and difficult to repair. Finally, a major incident of vandalism occurred in February 2006, in which four basins were ripped off. It was determined that the time had arrived to do an extensive repair and parts replacement. The City contracted with Galbraith and Associates and Kramer and Company to assist in evaluating options. The overall goals were to (1) replace the basins with an interest in historical accuracy, (2) reduce the likelihood of vandalism, and (3) to make the fountain easier to maintain without the use of chemicals. The final recommendations were to make a bronze casting of the basin, powder coat them white for historical accuracy, add chrome plated bubblers that allowed the fountain to run at least 18 hours a day to reduce gas build up, and to add potable water so that each basin could be rinsed daily to avoid mineral build up. The Historic Commission enthusiastically supported the plan and $35,000 was allocated to accomplish the task. Step by step, these recommendations were carried out. Conducting a national search, George Kramer located a ceramic basin nearly identical to the original basins in an architectural salvage yard in Berkeley California. Ten new basins were fabricated and sent to Cincinnati to be porcelain powder coated. All of the associated plumbing was completed. The granite base “donut” section was replaced. A steel armature was installed inside the granite section to hold the basins in place. The final addition was the return of the historic sign denoting the origin of Lithia Water. This was a complicated project that required extensive time and expert supervision to complete. George Kramer commented that “This is the most complicated ten square feet I have ever worked with in my life.” The result is commendable – a working fountain that is historically accurate with the original. Ashland citizens should thank the City Public Works department and George Kramer for their devotion to this project. After moving to Ashland in 2004, Cathy DeForest opened a gallery on Fourth Street in Ashland’s Historic Railroad District. As she proceeded to learn about the richness of the Railroad history and the lack of awareness of this history, she created the Ashland Railroad Association which publishes a walking map of the district, and a web site highlighting the historic buildings, galleries, restaurants and accommodations in the district. The collaborative marketing efforts of over 30 businesses in this association have increased tourist and local traffic to this key part of Ashland. Recently signage designating the Railroad District was put up on the street signs to increase awareness. Recently Cathy and her husband Leon Pyle have raised awareness about the historic and environmental concerns of the City’s Lithia Spring property where the Ashland Gun Club resides. They have made hundreds of citizens aware of the historic relevance of this land. Indigenous tribes used this land for thousand of years as a ceremonial and trading ground. The source of the Lithia Springs, which were so important to the founding of Ashland, is also there. 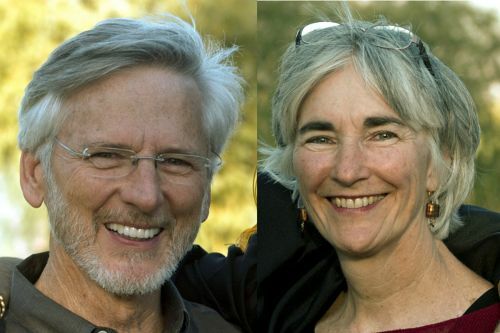 Cathy and Leon are also supporting an effort by Tom Doty to chronicle the stories of the Native American use of the Emigrant Springs in this area. As a result, Cathy and Leon helped form the association, The Citizens for Fiscal and Environmental Responsibility and presented over 480 signatures to the City Council asking for an environmental impact study to be made before renewing the Gun Club lease. Cathy and Leon continue to work with the City Council to promote the City of Ashland’s responsibility to be good stewards of Lithia Springs, the sacred and historic land leased by the Gun Club from the City of Ashland. Leon has a therapy practice in Ashland and Cathy is now a full time artist and educator.